LENGTH: 5.4 km Circular Route. ACCESSIBILITY: From the city centre of Dénia (Pl. Jaume I), we access by the road: Camí Pou de la Muntanya up to the Sanctuary: Ermita Pare Pere. 100 m above, the dirt path starts, where we can find an information panel next to a chain which hinders the passage of motor vehicles. We continue hiking and we turn left at the fork of the road called Camí de la Colònia. 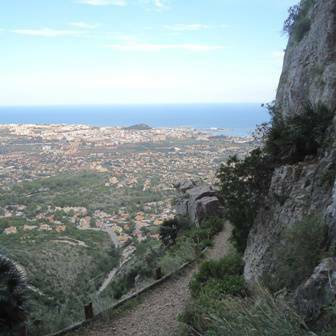 After a few meters, we exit this road and take the upward path towards the Cave: Cova de L’Aigua. We pass through a shady area of Montgó which has been declared a micro-reserve, which has a wide variety of plant species, including endemic species in danger of extinction. Consequently, we must walk exclusively on the path and prevent all impact. We arrive at the cave entrance after climbing up several steps with a considerable height and we can see 3 compartments which were used as a water reservoir in different ages. 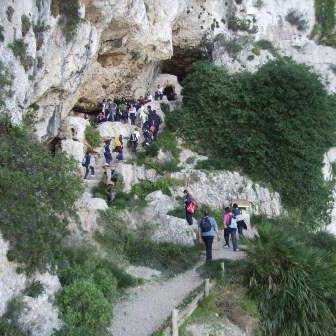 It is only possible to access the cave's initial sector. The visit requires a torch. The cave is frequently flooded with water in times of heavy rainfall. The cave entrance has a Roman inscription dated in the year 238 A.D. Ruins have also been found in its interior which provide evidence that the cave was used in the Iberian Age or in the 4th and 5th centuries as a place of worship and subsequently in the Islamic period. It even had clay pipe channels to supply water to the settlement which existed in one section of the Montgó mountainside. 16th and 17th century. We return on the same path and at approximately 200 m, we take the bypass to the left towards Racó del Bou; first, an ascending section and then it descends until it connects to the end of Camí de la Colònia on the West and we follow it to return to the starting point.